2013 - The Nuns' Well - Los Vaños de los Agares. 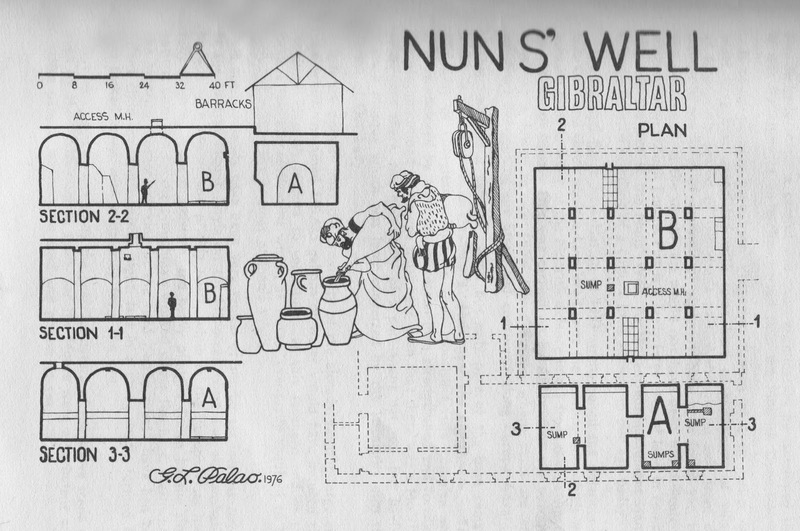 When I lived in Gibraltar during the 1950s, it never crossed my mind to have a look at that enigmatic underground structure known as the Nuns' Well. In fact I didn't even know it existed. Mind you I wouldn't be surprised to learn that it was out of bounds to Gibraltarians in those days. The oldest written reference is that of Pedro Barrantes Maldonado in his curious Diálogo entre Pedro Barrantes Maldonado y Un Caballero Extranjero ( see LINK ) which was published in 1566 but refers to an event which occurred in 1540 in which Maldonado was actually present. The second oldest written reference, is that of Alonso Hernández del Portillo writing in the 1620s. ( see LINK ) He tells us that it was an admirable building, that it was used as a cistern and that it was of Moorish or even earlier origin. 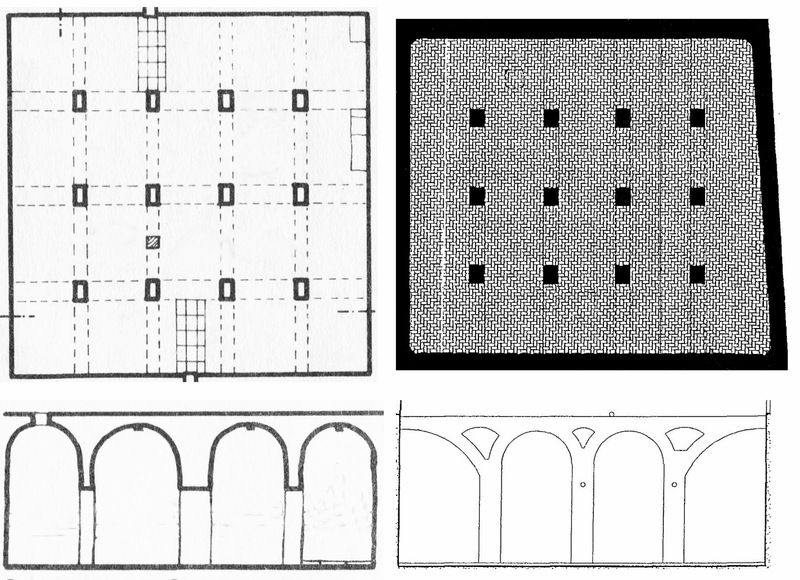 Its shape was in the form of a parallelogram and the ceiling or roof was held up by 22 brick pillars. The entrance was via brick staircase and according to the author it must have been created by people with greater skill than he would have expected of the Moors as it had been hewn out of solid rock. The walls are covered with bricks set in extremely strong mortar which was appropriate for a place which was meant to hold water. Los vaños de los Agares. 'Los vaños de los Agares' may or may not translate as the 'baths of the demon dukes that rule the eastern part of Hell' - but it takes us no further forward. By 1756 a well known German map maker has subtly changed the name. It has become the 'ruins of a famous cistern known as the Moorish baths'. During the middle of the 18th century the Governor of Gibraltar, Lieutenant-General Thomas Fowke ( see LINK ) had the place cleaned and repaired in order to have a ready supply of water for his troops. One would guess that the alterations ordered by Fowke were mostly limited to making it water tight but it would be interesting to know just how much he altered the appearance of the place in so far as its arches, pillars and other structures are concerned.
. . . turning to the east we went to what is called the Nuns' Bathing-Bath. This is a place sunk in the ground paved at bottom with brick, it is about twenty feet square, and had formerly different partitions, perhaps for different sexes, with a building over it. The monastery was said to be placed at a small distance from it though now no appearance remains of any building having ever been erected. There is now but a small depth of water in the bath, which is said to be only whaen it falls from the heavens, and not from any spring therein, as I can learn; it is sometimes quite dry and used as a regaling room to dine in. In 1771 Thomas James ( see LINK ) gives a rather more detailed description. An old watch tower is on Europa Wall . . . . Near this tower is a centinel's box built on a wave-worn rock . . . vulgarly known as Europa point. . . on this plain of Europa is a Moorish Bath, on the north of which, and up a steep part of the Rock is beef-steak cave . . .
To the eastward of this building, and on the same rocky plain, is a Moorish bath sunk in the rock ; the length is seventy feet, and breadth forty-two ; the whole arched, which springs from twenty small square pillars of brick and ten imposts; most of them being entire, but the crowns of these arches in some places are fallen in, as is likewise the entrance in front. The floor has been paved, but there are very little traces now to be discovered. In winter, it generally has four feet water, which diminishes in proportion as the heat of the summer increases: it was repaired by order of General Fowke, whereby the water is preserved. As far as I can make out it was John Drinkwater Bethune of Great Siege fame who first came up with the name Nuns' Well. It appears in his History of the Great Siege of Gibraltar which was published in 1785. Despite the new name, his description is very much in line with everybody else. One can only presume that the soldiers made some sort of connection between the nearby church and the structure, although of course there were no nuns living there at the time. Local historian George Palao writes that on one particular map it is described as 'A bathing place for ye nuns of Nostra Senora D: Europa'. I have looked. I cannot find it. Next came the appointment of Prince Edward, Duke of York as Governor. ( see LINK ). His attempts to impose discipline on those unfortunate enough to be stationed on the Rock at the time included the closure of thirty pubs, making forty of the rest out of bounds, and only allowing the sale of beer for the troops in three of them. He then set up an army brewery at Europa. Then in 1971 a certain Mr B. Drissi, Inspector of Antiquities to the Government of Morocco and an expert on Moorish architecture was invited to Gibraltar to give his considered opinion. His conclusion was that the structure predated Gibraltar's Moorish occupation. But as far as I know he gave no indication as to whether it was a cistern, a bath - or indeed something else entirely. 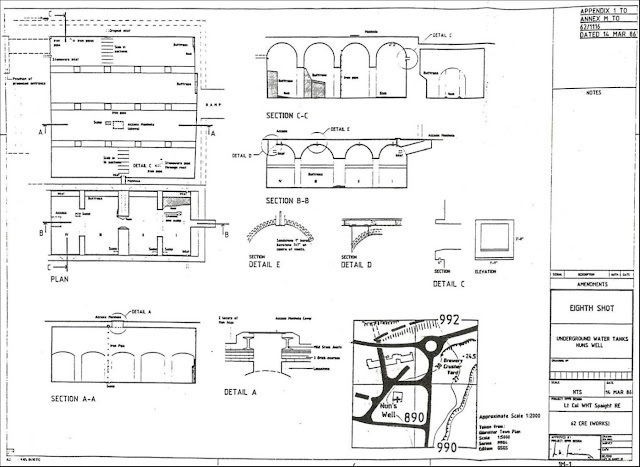 Neither of the plans shown above seem to have been put into practice although a somewhat similar building to the second was in fact built. Other than some acrimonious complaints by local groups at the ineptness of local government attempts to improve the surrounding area, the above is the state of play at the time of writing. So what on earth is the Nuns' Well, what was it used for, when was it built and who built it. The Arches - Yet another local historian, Tito Vallejo, has suggested that the two types of arches found in the Nuns' Well are of Mudejar or Moorish design. I am not an architect but I find it hard to believe that the shape of the arches can offer any clues as to the when the Nun's Well was constructed. These arches could be described as either semi-circular or segmented ones. Both were apparently 'invented' by the Romans. The first was perhaps 'the' original arch, the second used for the first time around the 1st C BC. As these styles can be found all over Spain on buildings known to have been built by either Romans, Visigoths, Moors or Christians there is really no way of dating the place from them. An Ancient Jewish Mikveh - Vallejo does, however, offer another interesting theory. He suggests that the Nuns' Well was a bath, but that it was of Jewish rather than Moorish origin. In other words the place was a traditional Jewish Mikveh. The main similarities between a mickveh and the Nuns' Well can be summarised as follows. Smaller chamber used as original collection area. Nuns' Well possible immersion chamber seems deep enough for full immersion - a most for a Mikvah. And finally, an indirect point in favour. It is hard to put forward the theory that it is a Moorish bath - if the design of the one in the town is anything to go by. 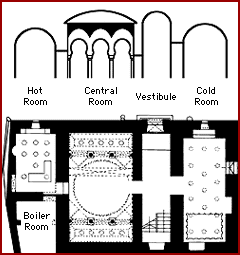 The Nuns' well would need at least one other chamber to house the all important hot room. 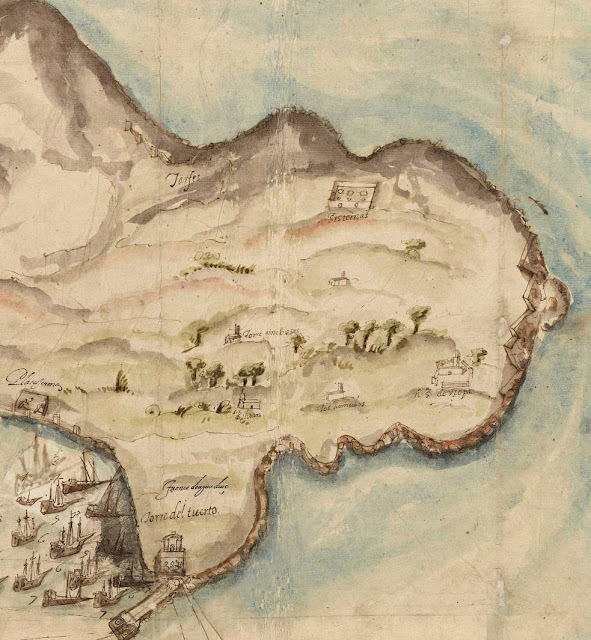 Nevertheless Vallejo suggests that during the first Jewish Diaspora and well before Tariq's little trip across the Straits of Gibraltar, ( see LINK ) it would not have been at all unusual for at least some of the Jewish people to have settled in Carteia or anywhere along the Bay within sight of the Rock. From there to moving on to somewhere on the Rock would have been but one short step. In 1476, the Duke more or less reneged on the deal and expelled no less than 4,350 Jews from the Rock. Could the Nuns' Well have dated from this period? An Ancient Cistern - George Palao offers a different theory. The Well was actually a cistern built by an unknown culture - Roman, Visigothic or even earlier - and of which we know very little today. It was used - he suggested - to irrigate Europa flats so that it could be used for agricultural purposes. Settlements in the South - The main problem with pre-Moorish theories is that there is precious little evidence in the literature as to whether the Phoenicians, Carthaginians, Romans or Visigoths ever set foot on Gibraltar - nor that the Jews did so prior to Tariq. As regards the Jews who settled in the 15th century it hardly seems possible that they would have built the structure within the two years they were actually on the Rock. The 'Well' is carved out of solid rock. 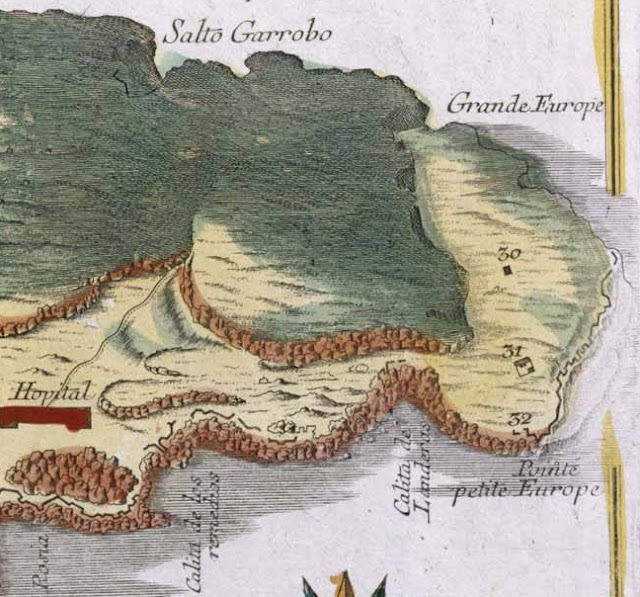 However, I have always found it difficult to believe that absolutely nobody living in Carteia or anywhere else along the Bay of Gibraltar over a period of well over a thousand years might not have thought it a good idea to explore that huge chunk of Rock right in front of them . They could hardly miss it. And it wasn't as if it was totally inaccessible. In fact it was relatively easily to get on to it either from the red sandy beach in the north east - the old mole area - or from Rosia - the new mole area. As regards living on it, the north may have been steep and relatively uninviting but the south - Windmill Hill and Europa flats are . . . well pretty flat and easy to build on. There was nothing to stop people from settling there if they needed to or wanted to. And over a thousand years there must have been plenty of both. Los Tarfes bajos, los Tarfes altos, la Torre de los Genoveses, the existence of windmills in - yes, Windmill Hill - the inexplicable 'Inquisition' building, Skinner's Moorish wall ( see LINK ) near the so called town of Coral de Fez with its sea gate, the Puerta Morisca de Coral de Fez, all point to some sort of older community living in the southern part of the Rock. 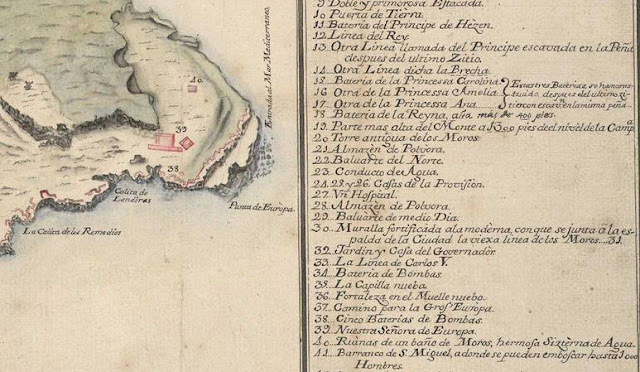 When the Merinid leader Abu-l-hasan decided to strengthen Gibraltar's defences in 1333 ( see LINK ) he made sure that the sea walls would stretch in a continuous line from north of the water gate to Rosia with a gate at its southern extremity which came to be called the Puerta de Algeciras. It may have occupied the site of the above mentioned Puerta de Corral de Fez. And it didn't stop there. 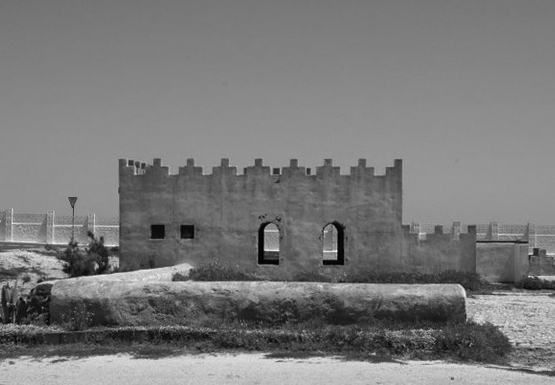 The wall continued right round to Europa point and beyond, where the ruins of yet another tower can still be seen. 13 The point is - why on earth would Abu al Hasan - and his rebellious successor and son Abu Inan - have bothered if there was hardly anybody living in the south? The Spanish historian, Ignacio López de Ayala taking it from Portillo thought there was a large settlement in the south complete with mosques ( plural ) with towers, water cisterns ( again in plural ) ) and old vineyards. There are several 17th century maps that seem to back him up by showing the odd unidentified ruin or building in the south. In other words there can be little doubt that there was an old settlement in the south - mostly concentrated around the Torre del Tuerto and its mole. I actually think that the 'new mole' in its original incarnation is actually older than the 'Old Mole' - and I suspect the Nuns' Well is simply part of that complex. My own Theory - I don't really have one. However, it does seem doubtful that its original purpose was as a reservoir of drinking water. 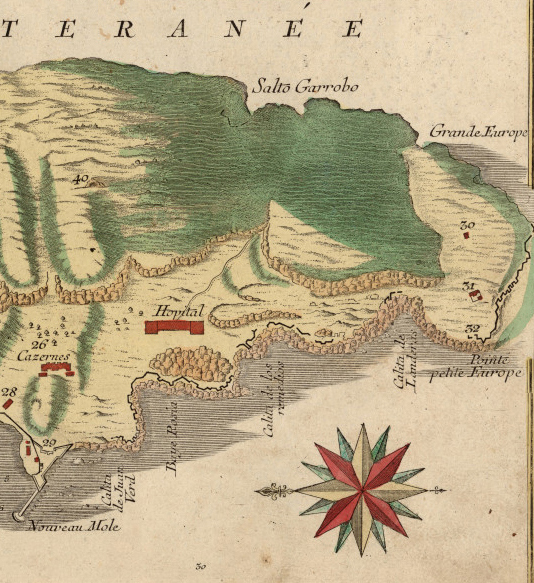 The stuff was often brackish, was probably contaminated by local run-off water, and was full of leeches - hardly in line to compete with Aqua de Solares - and Gibraltar was - surprisingly for a modern reader - renown throughout the area for the quality of its water. Given that, I would side with George Palao. Despite the seemingly superfluous two chambers and the lack of any exit hole to distribute the water, I would still opt for some sort of reservoir used for irrigation purposes - especially along the south-western side in an area known as los Tarfes Bajos during the Moorish era. As regards the date of its construction - the reservoir or 'aljibe' of the Castle of Jimena de la Frontera is extraordinarily similar to that of the Nuns' Well. The Spanish historian Hamo Sassoon has suggested that the one in Jimena may have been built by al-Hajj Ya'ish, one of the architects of Medinat al Fath ( see LINK ) and the man who built a windmill on the top of the Rock in 1160. 14 Could he also have been responsible for the one in Gibraltar? Más adelante volviendo al occidente se ofrece otro edificio admirable de unas cisternas para recogimiento de agua, tal que osaría yo afirmar si fue obra de moros o más antigua que ellos. Esta hecho a forma de paralelogramo, que es un cuadrado imperfecto. Tiene de largo 78 pies, de latitud 48 y para sostener el terrado que lo cubre tiene 22 pilares de ladrillo. Bájese a el por una escalera de ladrillo, obra que debió ser hecha por hombres más curiosos que son los moros, porque está cavada en peña viva. Tiene labrados las paredes y pavimento de ladrillo con fortísima argamasa, cual era menester para retener el agua que en aquel aljibe se recoge. Pero es dolor ver como todo lo ha consumido el tiempo que acaba todas las cosas, y más presto las que han menester de reparos y no se reparan. Admirable cisterna Corral de Fez Al levante de la virgen de Europa se ofrecía el admirable edificio de la cisterna, aljibe ó recogimiento de agua , tal i tan magnífico , i de tan Fez. grandiosa arquitectura , que no es fácil adivinar si fue obra de moros ó más antigua que ellos. Es su forma irregular , de figura trapezoide ; larga de setenta i ocho pies ; lata ó ancha cuarenta i ocho, i cuarenta i dos ; i la altura es de ocho pies i medio. Para sostener el terrado que lo cubre tiene veinte i dos pilares de ladrillo, i debaxa á él por una escalera del mismo material. Obra , cierto , que fue abierta i levantada por hombres de gran curiosidad ; porque está cavada en peña viva , i en todo aquel sitio no se halla otro suelo con espacio tan igual i tan profundo. Tiene labradas las paredes í pavimento de ladrillo , con fortísima argamasa , qual era menester para retener el agua que se desprende desde las alturas , i se recoge en el depósito. Conservase en éste casi todo el año ; pero son muchas las quiebras con que el tiempo lo destruye. 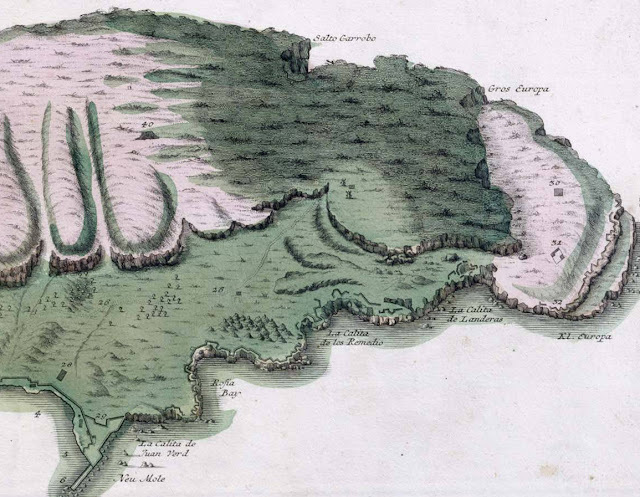 Al norte de la virgen de Europa, i sobre la caleta del Laudero, corría un murillo viejo , i en él una puerta á la morisca, que introducía al sitio llamado corral de Fez ; i á lo que se puede entender hubo allí alguna población de moros de Fez , ó mercaderes que conducían mercaderías de África á los moros Españoles. Si ya el sitio no fue más antiguo , i poblado por Tarik , pues se veían muchas paredes de piedra seca por aquellos contornos con los aljibes del Tarfe , cisternas para agua , mezquita con torre , las viñas viejas , con otras más particularidades ; i la cueva de las palomas , que parecía por la antiquísima obra que tenia , haber sido habitada , i donde se creía en el vulgo de Gibraltar que hubo tesoro. Nuns' Well consists of two large underground chambers. The well is thought to be a Moorish bath or cistern, however it could also be from an even earlier period of Gibraltar’s past. 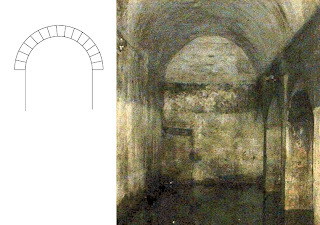 In 1753 the governor had the underground chambers cleaned and they were used to provide water for the soldiers. In 1802, the Duke of Kent arrived in Gibraltar, he set up a brewery at Europa called Brewery Yard, next to the Nuns' Well. The water from the chambers was used for brewery purposes. This brewery was later converted into Brewery Barracks. Abu l Hasan again applied himself further to strengthen Gibraltar, by causing a thick wall to be built at the foot of the Rock, surrounding it on all sides as the halo surrounds the crescent moon . . .
. . . sabemos que el arquitecto malagueño, al-Hafi Ya'is . . . alrededor del año 1159-1 160 empezó la planificación de Gibraltar; y que en los años 1170-1172 estuvo construyendo el acueducto de los Caños de Carmona. Teniendo en cuenta la presencia de al-Hay? 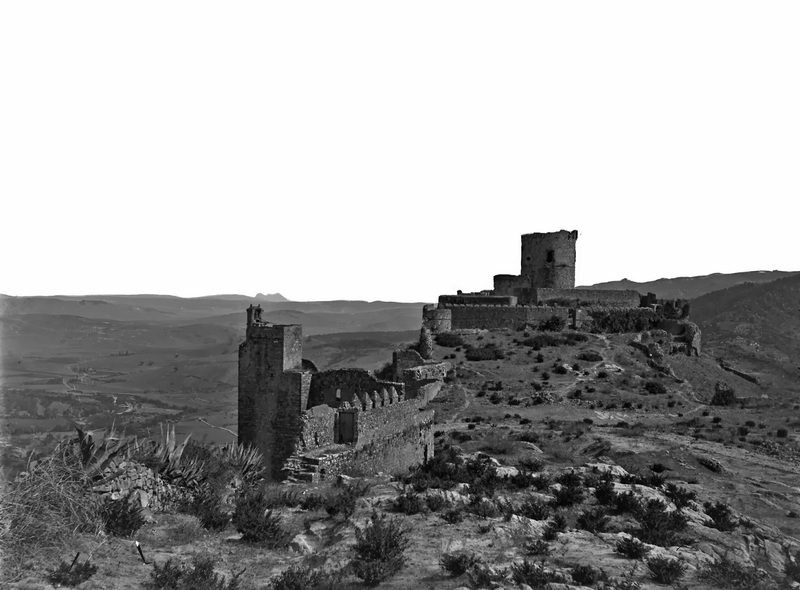 Ya'is a solamente 35 km de Jimena durante algunos de los años entre 1160 y 1170, y el notable parecido entre el sistema de arcos y arquillos en el diseño de los Caños de Carmona y los mismos del aljibe en el Castillo de Jimena, parece casi seguro que el mismo arquitecto hubiera sido el autor de ambas construcciones. 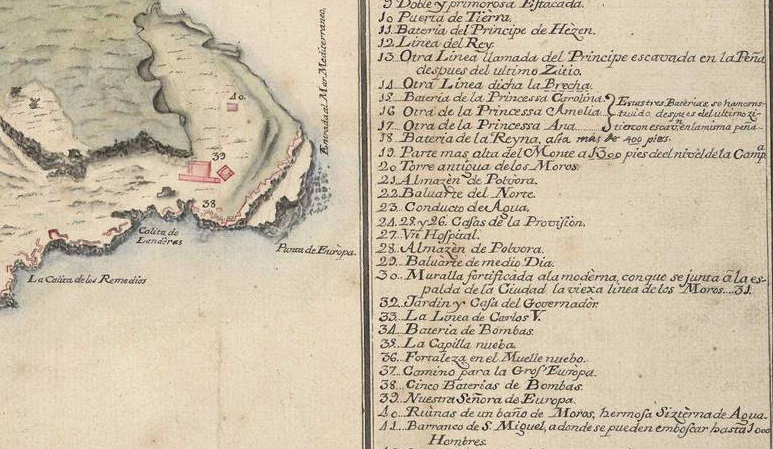 Y que haya hecho el aljibe en Jimena entre su planificación de Gibraltar, empezada en 1159, y su trabajo en los Caños de Carmona, acabado en 1172.